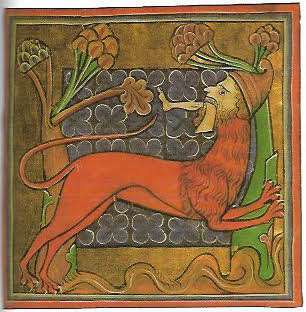 He is described in this way: “In India there is a beast called the manticore. 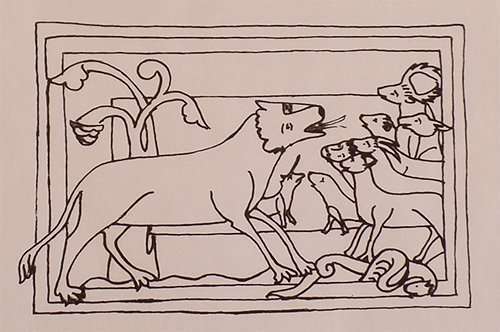 It has a triple row of teeth, the face of a man, and grey eyes; it is blood-red in colour and has a lion’s body, a pointed tail with a sting like that of a scorpion, and a hissing voice. It delights in eating human flesh. 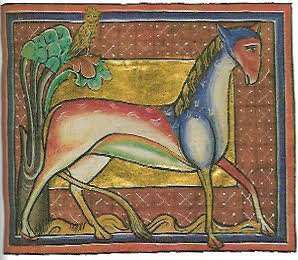 Its feet are very powerful and it can jump so well that neither the largest of ditches nor the broadest of obstacles can keep it in.” Note: don’t miss the human foot hanging out of his mouth, no doubt the remains of his favorite meal! 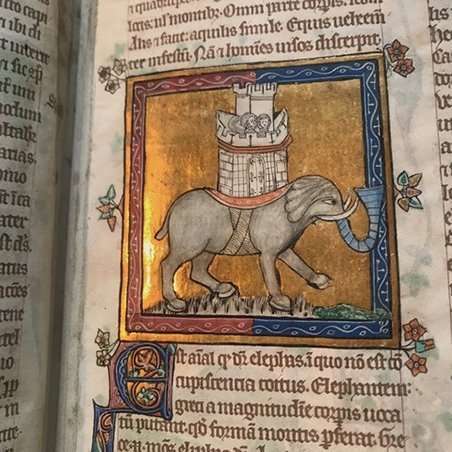 Bestiaries are fascinating documents – sometimes funny (not that they were intended to be funny! ), sometimes instructional, and even a little raunchy from time to time. 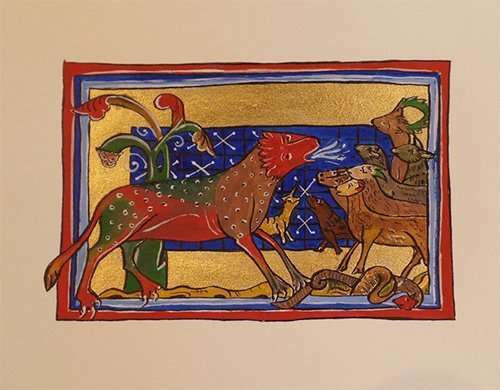 In their day, bestiaries were taken quite seriously because they were meant to educate and warn readers about the dangers of certain creatures. 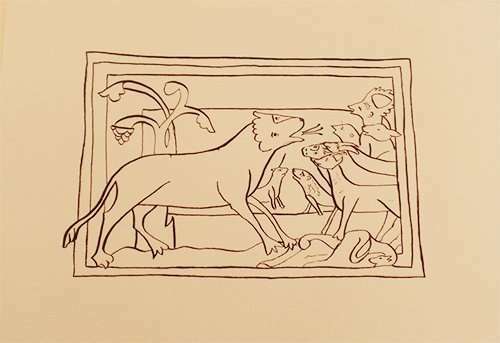 And perhaps just as important, the animal behaviors were used to draw parallels to human ways and to demonstrate the importance of good moral conduct as well as the consequences of unchaste behavior. 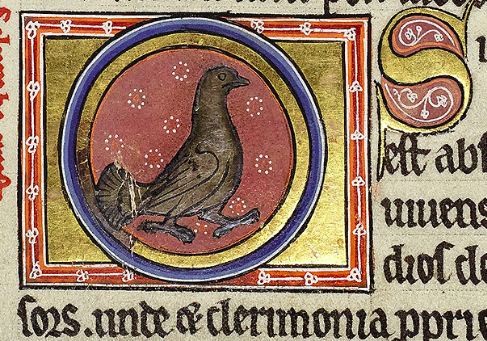 There are two things in particular that make bestiary painting among my favorite things to paint. First, it can’t be done “wrong” because what you are drawing is likely the result of someone’s imagination, based on stories that had been told. You can’t draw an eale incorrectly because there is no such thing! 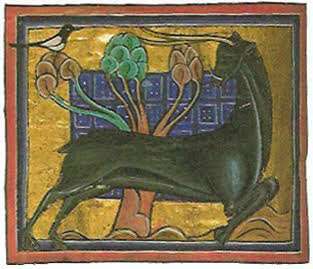 And second, the scribes who created the bestiaries (and lots of other manuscripts) were copyists – their job was to recreate the same image as had been painted previously in another bestiary. They developed some very interesting techniques to do that. One way would be to punch a series of small holes in the “model” image they were using as a source. 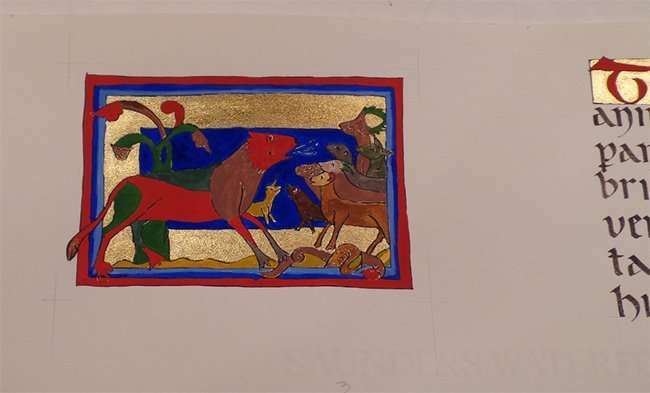 They would then lay the model image on top of the vellum for their bestiary and they would dust powdered Armenian bole (red powdery clay) over the original. 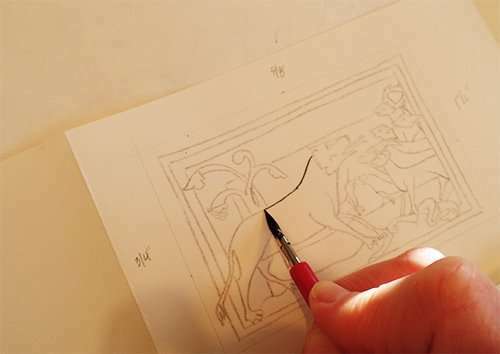 (This technique is somewhat similar to what we might call stenciling today.) 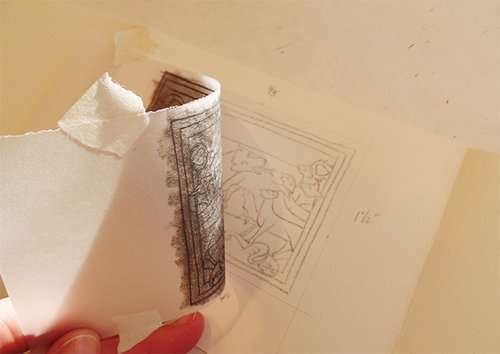 When they lifted the original, a dotted image duplicating the original was left on their vellum. 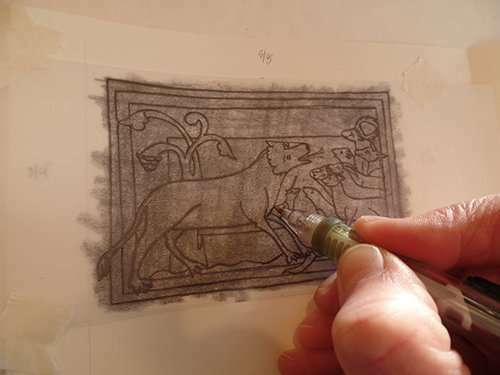 Another way they copied an image was to cover the back of the source image with powdered bole and transfer the image by tracing over the original while it was positioned on their vellum. 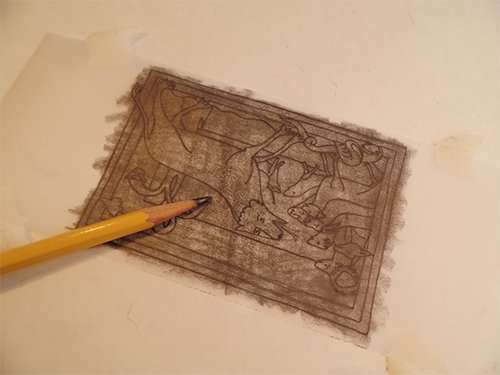 This second technique is the one we’re going to use for the purposes of this blog, although we will use graphite from a soft drawing pencil rather than Armenian bole. 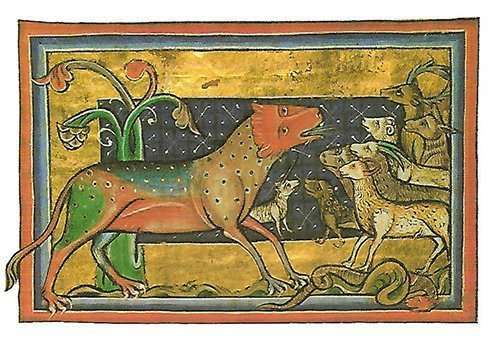 Notice the panther’s multiple colors and spots, the breath coming from his mouth, the other animals – so attentive to the panther – and the dragon in the “bowels of the earth” in the lower right corner. 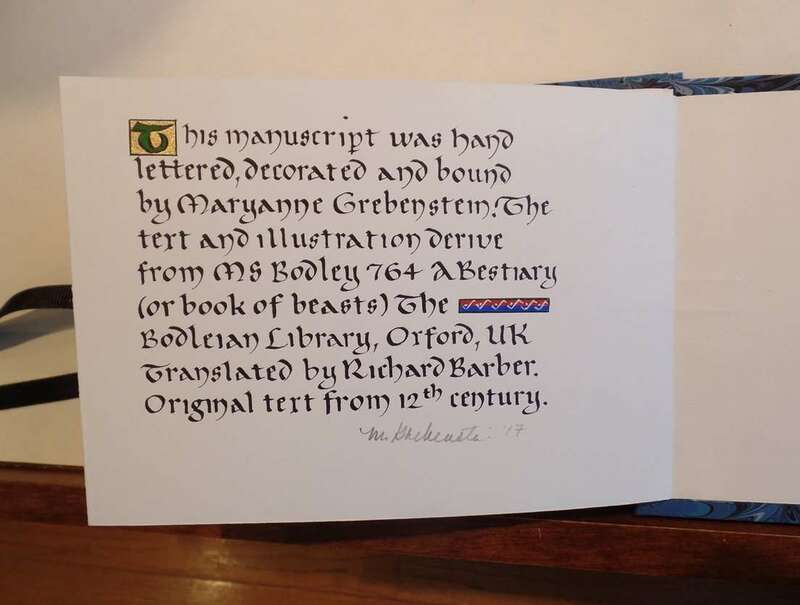 To give you a sense of scale, the Aberdeen Bestiary has folios that measure approximately 7-1/2”w x 12” h. Although the illustrations are not uniform in size, they are similar in size. I estimate the illustrations to be generally about 4” w x 3-1/2” h.
Once I made my selections for the text, image, and lettering style, I needed to establish the layout. 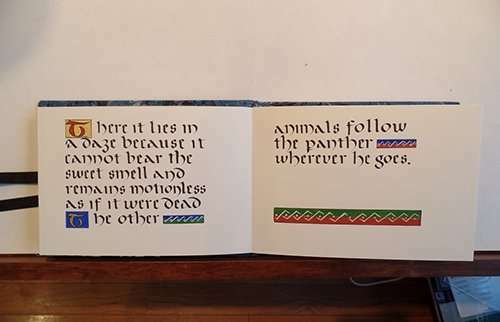 I decided to do an accordion book for my little panther excerpt. 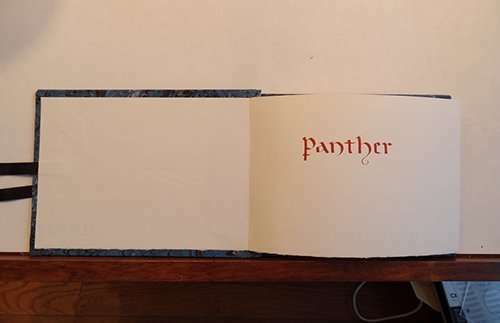 The horizontal format of the image to be used helped inform the orientation and approximate size of the book. 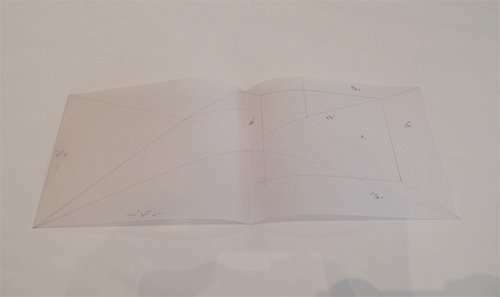 I settled on a book that would be about 6-3/4” w x 4-3/4” h. Knowing this size, I was then able to determine the text/image size available to me by using the golden rule process (also known as “golden mean,” “golden proportion,” and other names). 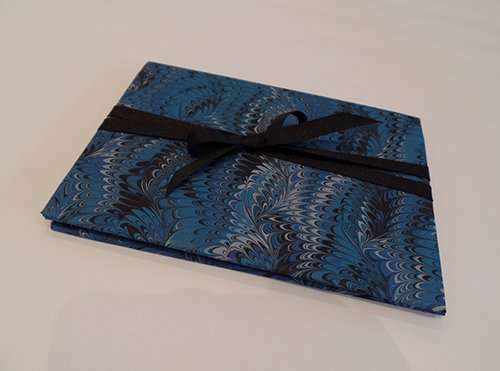 (Please refer to one of my prior blog posts: Golden Rule for Book Design). 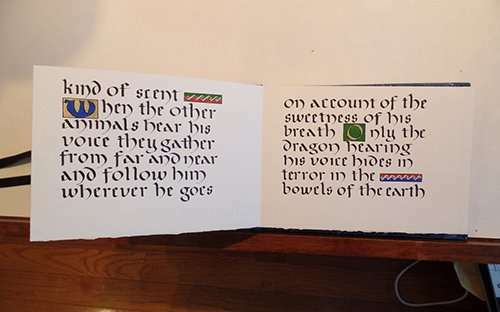 The golden rule process tells me that for a page 6-3/4” w x 4-3/4” h, my text/image area will be 4-1/2” w x 3” h – pretty close to the estimated image size in the Aberdeen Bestiary. 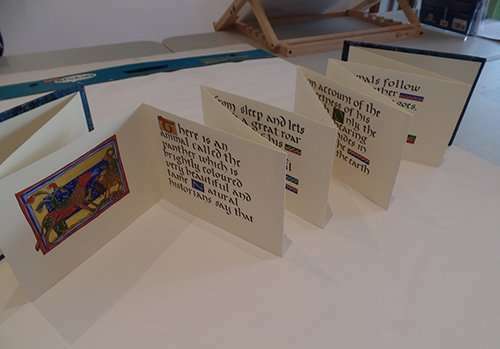 In the process of creating a book such as this, the text is lettered before any decoration is done (which sometimes surprises people to know). 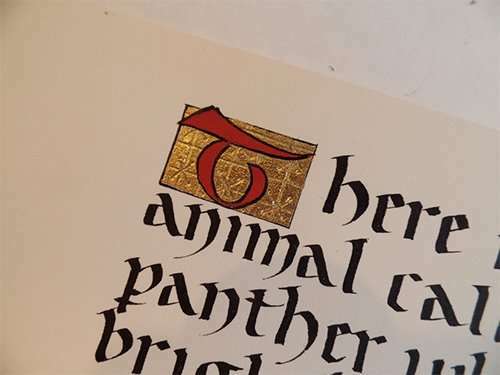 Note to the purists who might be reading: If some of you are feeling like transferring art is cheating because you are not creating your own original artwork in the bestiary, fear not! 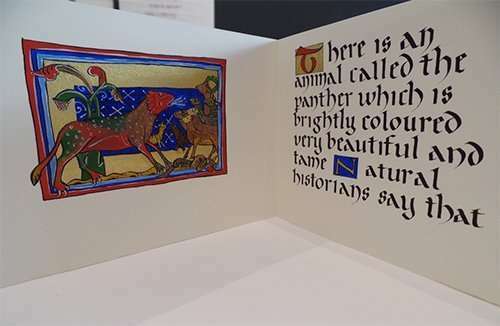 This is exactly the technique that a medieval scribe would have used. 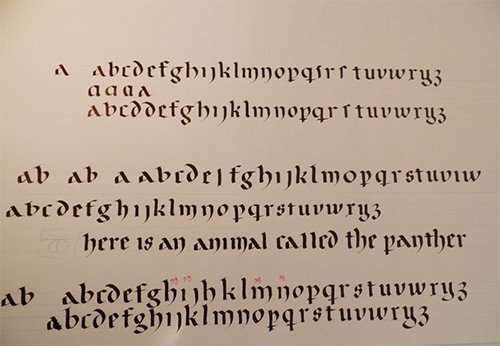 As I described in the beginning of this blog, these techniques were actually developed during the Middle Ages for this exact purpose. Remember, they were copyists! Theirs was not the domain of creating fine original art. Once the inking was complete, I erased the pencil lines and my image was ready for the laying of gold and color. 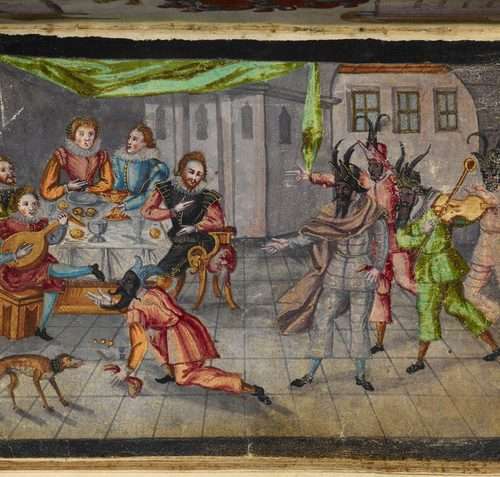 Historically, these miniature paintings would have been created by working from dark colors to light colors. 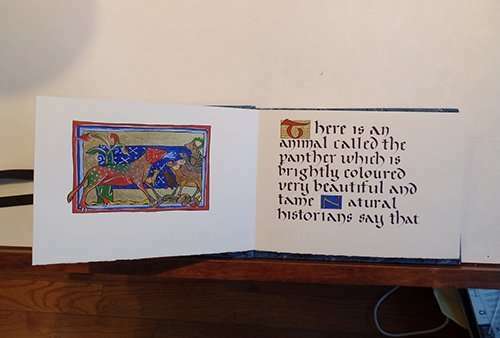 This is in contrast to the way most painters work today, but I used the medieval process for my little panther painting. 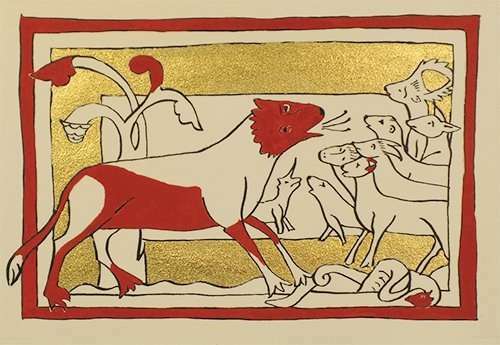 Before applying any color, though, the gold was applied onto the line art. If I had been using gold leaf (in a process called Gilding), I would first have applied several coats of gesso, followed by the gold leaf. 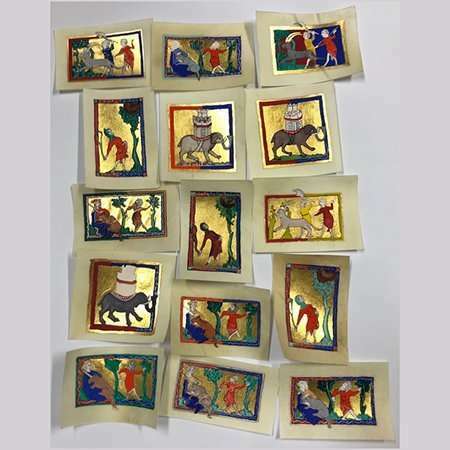 (Please watch for a future blog post on Gilding for more information on that process.) 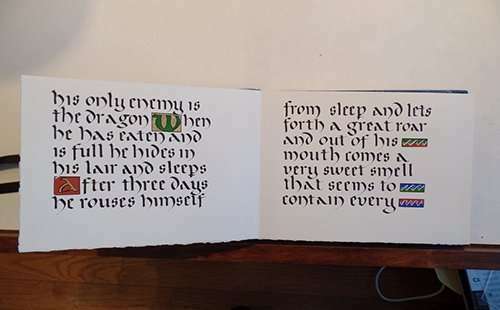 For this book, I used gold paint, rather than leaf. Once all the solid colors were in, I began layering the lighter colors on top, to add detail and depth. The final color was white, and my little bestiary painting was complete. 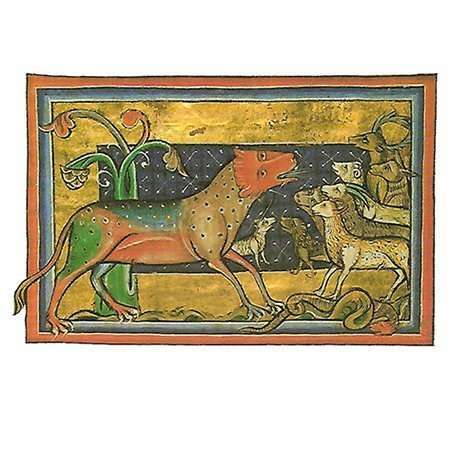 Note to reader: If you would like to register for a workshop on Bestiary Painting, offered periodically by The Abbey Studio in Marblehead, Massachusetts, USA, check our workshop schedule at http://theabbeystudioblog.com/classes/. I would like to come to your studio and participate in classes but I live in Oregon.